Depawater say Farewell to a Successful 2018! 2018 has been a great success for Depawater. It has been a tremendously busy but enjoyable year with lots of satisfied customers who have purchased and installed Tricel Products. Depawater have helped so many customers in various ways to move into their new home as smoothly as possible, from filling out Consent to Discharge forms, Site Visits, delivering their Tricel product promptly to site, Commissioning their Treatment Plants and providing our customers with peace of mind knowing that we always provide an Aftercare Service that is first class. So many of our customers in 2018 told us how easy we were to work with and we want to continue to provide a professional pleasant easy experience for the homeowner from start to finish. We hope that in 2019 we will continue to build many more positive relations with many more new Tricel customers. From all of us at Depawater, we wish you and yours a Peaceful and Happy Christmas and Best Wishes heading into 2019. 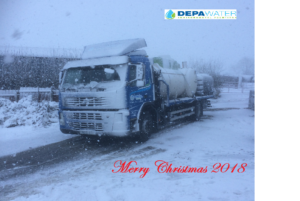 Depawater will be closed from 3pm on Friday 21st December 2018 until 8.30am Monday 7th January 2019. If you need to contact us please send us a message and we will get back to you on 7th January.